The Perils Of ‘Revisionist’ History! Whilst it is true that the past is the past and that we should be looking forward rather than back, history remains important – especially if that history is now being ‘revised’ and distorted with claims that are anything but truthful and has the potential to influence the present and future. This post seeks to correct these revisionist accounts by analysing the Hyams comments put up on the Bentleigh Action Group Facebook page. His comments are presented in italics. ….. when we consulted on the review of the planing scheme in 2010 -2011, we were told by the community that we should get mandatory height limits in residential zones, transition between zones and better protection for areas of significant neighbourhood character. We therefore changed our significant character areas to Neighbourhood Character Overlays, and added areas to those, and, as part of the zones that came in during 2013, achieved mandatory heights in all residential zones – the only Council to have this, and transition zones. Mandatory height limits were NOT imposed on all residential zones. MUZ (Mixed Use Areas) which are included as ‘residential’ were totally ignored and remained so until the introduction of the recent interim height limits in Bentleigh & Carnegie. All other MUZ zones in Glen Eira do not have height limits. There is not one single word in the 2010 Planning Scheme Review about mandatory heights for residential zones. Either this was not an overwhelming view in 2010, or the ensuing report was a total work of fiction. We’ve uploaded the report HERE and ask readers to carefully peruse this document. We challenge anyone to find a single word about height limits that does not relate to aged care only! The eventual Amendment C87 which introduced the Neighbourhood Character Overlays was totally inadequate. Many areas previously labelled as ‘significant’ became ‘non-significant’ . The total properties deemed ‘significant’ was just over a 1000 out of 50,000 plus homes. Further, nominations were made by officers alone. Both councillors and residents had no avenue upon which to include their nominations. The planning panel in fact stated that another amendment was required in order for residents to have other properties included. This took another few years and the additional numbers were less than earth shattering. It is also worth remembering that the Planning Panel report of December 2002, told council to introduce Neighbourhood Character Overlays. It took 10 years for council to get Amendment C87 underway!!!!! We ahd (sic) intended to wait for the respective state governments to finish further reviewing their planning policies before we did our next review, so we knew what we were working with but, as you noted, the government required us to proceed with our Review. The legislation requires local government to undertake reviews every 4 years. Council was required to undertake its next review in 2014. That would have provided them with a year’s ‘experience’ of the zones. Instead they requested and received extensions from Guy. Who applied for these extensions and whether they were done under delegated authority is the crucial question since there was no resolution permitting at least 3 consecutive requests for extensions. Readers should also note that the authority to request extensions is not delegated under the legislation. Thus, the questions remain – did councillors know that these requests had gone in? Were they supportive of these requests? If Wynne had not finally had a gut full of Glen Eira, and refused their latest request for a 2 year extension, would we still be sitting on our backsides and not have had a planning scheme review in 2016? It is notable that, as part of its review of the planning zones, the government has decreed that all General Residential Zones should now have mandatory height limits. We already had this, but many others had heights that were lower, but discretionary. Furthermore, the new mandated height is 11 metres, but we stay at 10.5 metres because that’s what we have in the schedule to the zone. It would therefore appear that we were ahead in this, rather than outdated. Again, what is not stated is as important as what is stated. With the new legislation of VC110, councils have been given 3 years (from March 2017) to come into line – ie 9 metres in NRZ and 11 metres for GRZ. All councils will then revert to these heights regardless of whether or not their current height limits are lower. Even more important is the fact that council decided that what was previously a 9 metre discretionary height limit should overnight become a 10.5 or a 13.5 height limit across the board – all done in secret and without any consultation whatsoever. Other councils of course analysed their municipalities and produced various height limits to suit the specific areas. In other words, they actually did some decent planning. Glen Eira did none of this. The committee advising the government in its review stated very clearly that the default zone should be the GRZ, not the NRZ as it is in Glen Eira, and that the NRZ should be used sparingly. This, if implemented, would have resulted in far more streets like Princes Street, not fewer, but fortunately, the government has not chosen to redraw the boundaries, despite the recommendation. It is also fortunate, therefore, that we had the zones implemented before the committee report. The effect of implementing the zones before the committee report, and being the first council in the state to do so, gave developers a year’s head start to exploit the new height limits in both the GRZ and the RGZ. Developers now knew that they could build 4 and 3 storeys with impunity across large swathes of the municipality. Also worthy of comment is the fact that the Planning Panel report of 2004 stated unequivocally that council needed to address the borders for its neighbourhood centres and consider whether some suburbs like Murrumbeena and Ormond were in fact suitable candidates for designation as neighbourhood centres. Council has totally ignored this for the past 13 years. The panel also repeatedly stated that amendment C25 was viewed as ‘interim’ and that council must proceed with far more and immediate strategic planning to iron out all the anomalies. This never happened. Even the later government Advisory Committee report had this to say about the process that Glen Eira used to introduce the new zones in 2013 – especially the lack of strategic justification and lack of consultation. The State Government has not redrawn the boundaries as Hyams stated. This has been left up to individual councils. So what does our mob do? Borders have expanded, hundreds of currently zoned NRZ properties are now ‘suitable’ for 3 to 4 storey development and current 4 storeys may well become 12 storeys. Is the past about to repeat itself? Where is there one iota of strategic evidence for any of this current planning? The past is thus crucial to an understanding of the present and the future. As a result of this past council now finds itself with a deluge of required work. For many areas it is far too late to ameliorate the damage already done. Structure planning is the start of a long overdue process. It is up to residents to decide whether the eventual outcomes from the current planning efforts are adequate and deliver what is expected. But structure planning is only the start. The most important aspect will be the ensuing amendments and their strategic justification, plus the accompanying schedules to the various zones. Residents have made their views absolutely clear. Councillors had better be ready for an almighty fight if residents feel that the past is about to be repeated. Once bitten, twice shy, thrice very very angry. History is repeating itself with the pro-development propaganda coupled with great storey (pun) telling by one councillor in particular. Will the councillors back the wrong horse again? The anger is palpable and the new councillors will be defined by the decisions that are made on planning issues. They must see what’s happening, if not they are fools. They have sought advice from one councillor but this councillor is not interested in what’s best for the community. They will be tarred with the same brush if they follow aimlessly. But to take a stand and represent the community would be significant turning point for community relations. The DAFT concept plan for Carnegie shows Chestnut Street as a heritage area with 1 to 2 storeys. Directly behind it is an urban renewal development area for up to 12 storeys. How is it possible that Council could put this out for consultation? Is this an example of the transition planning that the councillor was referring to? Has he totally lost the plot? How can the planners consider the DAFT concepts to be appropriate? Only in Glen Eira! What about the Council promotional line that we have listened to community. And this is just one example, same goes for Elsternwick and Bentleigh. This situation is totally unacceptable so is the claim that Council has responded to feedback. Crap. Why should we now have to now sweat on these DAFT concept plans while council further consults. The response is pretty clear, apologise for the huge errors and provide the REAL concepts asap. Thank you for revisiting this history. I’d forgotten a lot of it. The past does play a significant role here because I fear we are heading down the same path of development for development’s sake. 1. why do we need twelve storeys in Glen Eira? 2. Why if we are so far ahead in development do we need more development? 3. Why hasn’t council joined other councils in opposing what Wynne has done? 4. When are are going to get some decent planning for the neighbourhood centres? 5. When will council let residents in on what it wants to do about parking and open space levies? 6. How much is this all going to cost? I think these are the fundamental questions that council has to answer. Until they do I remain a strong skeptic about their abilities and motivation. All fair questions that should be answered and have been asked. Why no answers? Understand your skepticism, your not alone. Hyams sounds like he just makes it up as he goes, which is of course what council bureaucrats are doing. Who could sort of the planning mess that goes back over 70 years, when the 60’s development boom went through the then Caulfield like bat out of hell. The present developers are in most cases just cleaning up what was left. I must admit I’m look forwards to Hyams latest pile of BS, He is a (MODERATORS: phrase deleted) versed in half truths,propaganda and tight-rope walking. He appears also to have a pungent dislike for residents. There something happening there that’s hard to work out. Ten to one he will be back in that mayoral regalia running the cover-up first hand the first chance he gets. Let’s hope this new lot of councillors stand in his way. Residents say a and council puts up b. Nothing’s changed since Newton left. I wonder where Council documented its various decisions that Cr Hyams claims it made. They weren’t in Council Minutes for example. No resolution and no delegation makes it sound like they were trying to avoid their obligations of transparency and accountability. Since Cr Hyams has referred to the outcome of the Managing Residential Development Advisory Committee, it should be pointed out that that committee was composed of members of the development industry and its recommendations were what the development industry asked for. The Report lacked strategic justification for most of the recommendations. 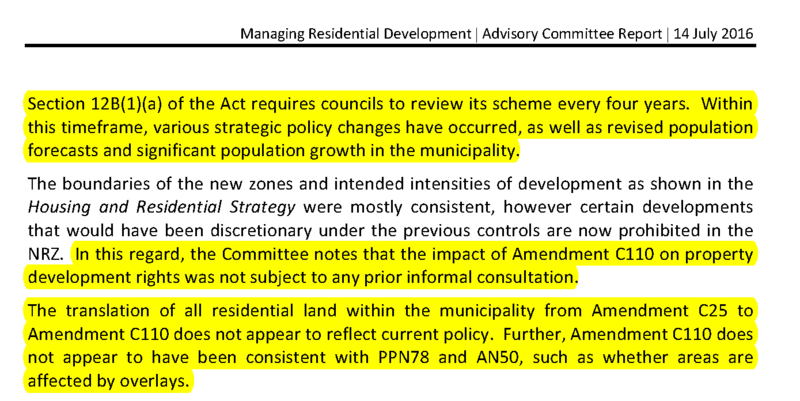 It’d be a brave Government that imposed GRZ on all land that used to be zoned Residential Zone 1, yet that is the development industry’s recommendation [with minor exemptions for heritage overlays]. Actually we now have pseudo-GRZ via changes to NRZ through Labor’s Amendment VC110. If in 2013 we had 85 years’ supply, you’d have to wonder how many years supply we have now. Council could publish how in 2017 it has calculated 37 years’ supply and why 37 years is an appropriate planning horizon. 37 years fits in neatly to the updated plan Melbourne is my guess. Maybe the new line of argument could be that since 2013 we’ve had 47 years worth of development. Sure looks like it with all the cranes everywhere and council’s lack of planning.